Next to the iMac in our home office, there is a phone. It is not a new phone. It's a corded phone, one that once hung on the kitchen wall at the apartment I shared with my then-fiancee. You can see the electronics and the circuit boards through the clear plastic, and all of the components are painted bright colors to create an artsyish effect. It rings by ringing a bell. No speaker, no tones, just an actual bell. You can see the bell, painted orange, next to one of the circuit boards. It's really, really loud, so we keep it switched off. The phone lights up when a call comes in, flashing orange. It has "memory space" for seven phone numbers, in that you can write down numbers on a brightly colored paper insert that slides into a plastic sleeve on the base. We never did. It's one of the first things my wife and I owned together, purchased back in the fall of 1991. It's a cheap, cheap phone, a Kmart phone, a phone whose brand hasn't been in business for almost twenty years. It's the kind of thing that you buy when you're paying the rent from your salary as a stock clerk in a little store. There's a large crack bisecting the middle of the handset, from one of the many many times it's been dropped in the last twenty-plus years. Still, it works. It's been used so long that the numbers on the handset have been worn away. Still, it works. No-one noticed when this phone was released, when the first units came trundling off of some Hong Kong factory assembly line. No-one waited in line to get it. No-one wrote excited reviews to distribute to all of their friends. They couldn't have. 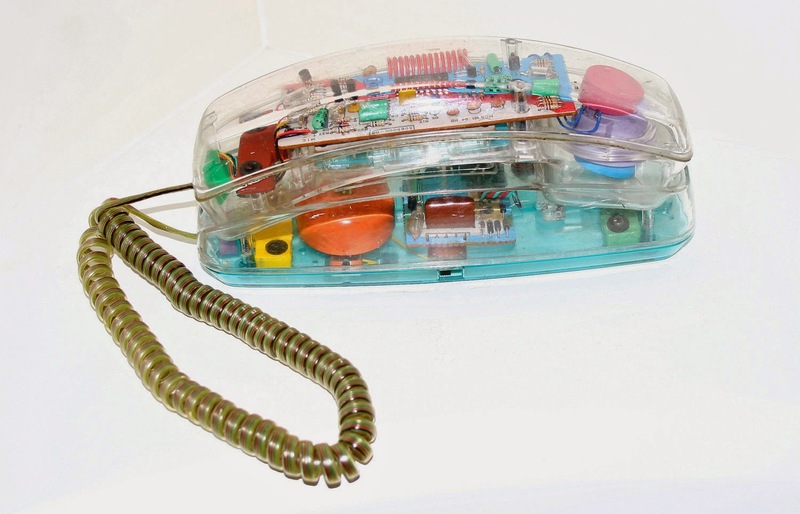 This is a phone that predates general public access to the internet. This is a phone that doesn't just predate smartphones. It predates the cellular era, hailing from a time when the only mobile phones were huge brick-like things, owned only by a tiny fraction of the wealthy. And still, it works. When I use it, it conveys the voices of those who are on the other end just as well as it did half-a-generation ago. I answer it, and I can talk to someone far away. What doesn't it do? It doesn't do anything else. It does not try to distract me with apps, or impress me in in any way. It does not make me feel scattered. I feel no compulsion to look at it when I'm working or writing. In fact, when I am not using it and do not need to use it, I forget about it, in the way that I can forget about breathing if I so choose. It commands none of my attention. It simply works when I need it to. And that humble, unobtrusive simplicity feels, in this wild, distracted, scattered mess of an era, oh...what's the word?